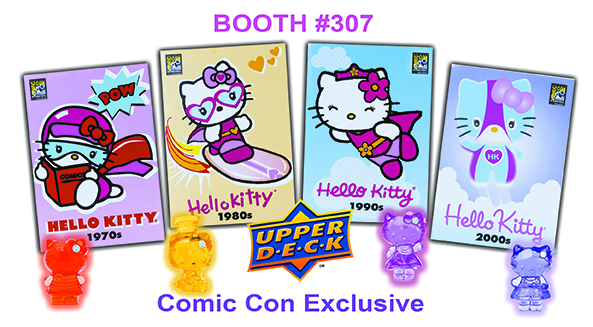 SDCC 2014: Upper Deck's Appearance Will Be Legendary! San Diego Comic-Con is under way and things are already buzzing. Upper Deck is heading to the show and you can find them at booth #307 in Lobby A with a variety of promotions exclusive for the convention. As Upper Deck prepares to celebrate Hello Kitty’s 40th Anniversary with a new line of trading card products, the company will make four different promotional bags available to attendees for $10 each or $40 for all four. Each bag includes an exclusive San Diego Comic Con Hello Kitty promotional card and figure celebrating the pop icon through the decades – 1970’s, 1980’s, 1990’s and 2000’s – along with an Upper Deck Hello Kitty figure pack! Fans who purchase all four bags will also get a San Diego Comic Con exclusive black sparkle figure as a gift with purchase! Bags are limited to just 250 per day and will sell out! Additionally there will be a variety of Upper Deck Hello Kitty products for sale at show specials and free Hello Kitty temporary tattoos distributed to all fans. Even Hello Kitty herself will be making an appearance at the Upper Deck booth for photo opportunities with fans on Thursday from 11:00 a.m. – 12:00 p.m., Friday from 10:00 a.m. – 11:00 a.m. and again on Saturday and Sunday from 1:00 p.m. – 2:00 p.m. The core comic fans however will love to check out the latest from Upper Deck on the gaming side of the business with the company’s popular Legendary™ deck building game available for purchase and to just check out. Key staff involved in the game development will be on-hand to discuss and share details on upcoming expansions of the game. One of the most exciting opportunities for comic fans however will come on Friday and Saturday when renowned artist Joe Jusko will be appearing LIVE at the Upper Deck booth to sign free oversized cards featuring his artwork for a future product release. Joe Jusko will appear Friday from 10:00 a.m. – 12:00 p.m., Saturday from 2:00 p.m. – 4:00 p.m and Sunday at 10:00 a.m. – 12:00 p.m. and again at 2:00 p.m. – 4:00 p.m. Additionally, artist Neal Adams will be signing some of his Upper Deck artwork at his booth in “Artist Alley,” so we encourage fans to drop in to check that out as well!